Fitting in at a new school is tough, especially when your first new friend turns out to be your worst new enemy. Such is the case in Family Secrets, a contemporary romance for young adults written by Gail Jones. This callous announcement sends Rachel on a quest to learn her true identity, but her discovery nearly destroys her family. Ms. Jones offers us a tightly-woven story, threaded with foreshadowing and colored with a few satisfying plot twists. I very much appreciated her smooth, seemingly effortless prose and a variety of creative word pictures. Consider the following clip: “All the brilliant colours of spring glowed around me and it didn’t seem right, how could they be so bright when my life was such a mess? Turning I ran my fingers down the rusty chain on the swing. Amongst all the new life of spring, this old swing was falling apart, just like my life.” Beautiful. From the first paragraph, Ms. Jones has our attention. We’re drawn into Rachel’s problems, into her world of makeup and texting and school. The plot moves logically. It’s a little coincidental at times, but it works. And we’re treated to a feel-good ending. I had difficulty swallowing the characterization, however. Rachel, while she’s obviously going through an emotional crisis, completely overreacts at times, blaming her parents, her boyfriend, lashing out in an irrational manner that alienates her from me. I didn’t feel such strong reactions were always warranted, and her heated arguments with her parents and with her boyfriend sometimes seemed long and repetitive. Emma, the bully, is a little one-dimensional. I felt like I could predict her words and actions. But Luke, ah, Luke is well-rounded and lovable. I was so surprised when this sporty, confident jock suddenly hangs his head and turns red. He’s shy! And we find out he’s not as perfect as we thought, which makes him perfectly endearing. He’s flawed and compassionate, insecure, from a real family with real problems, with believable reactions and motives. I loved him. I need to mention one more minor flaw. The Kindle download I purchased had formatting errors sprinkled throughout its entirety–mostly indents on second or third lines of short paragraphs. This small blip is easily forgivable, but it’s there. 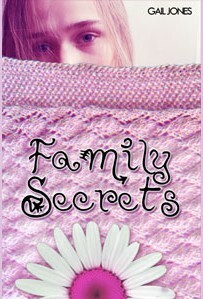 Overall, I enjoyed Family Secrets and believe it would be a satisfying read for any girl ages thirteen and older.